I have always had major trouble keeping my underwear drawer organized. I have an old dresser with large drawers, so everything always wound up in a big pile that I would have to pick through to find anything. 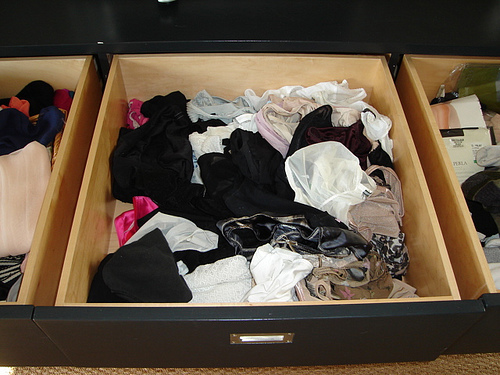 Socks, bras, underwear, pantyhose… it was all together in one drawer. I was CONSTANTLY losing the “other sock” in a pair. My bras were getting tangled together and stretched out from trying to pull them apart. And I wound up wearing the same pair of underwear over and over again, because I just picked what was on top. So I finally came up with a plan that works really great for me. Watch this video and find out how I keep my underwear drawer organized. Argh! my underwear drawer is in four drawers not matched, and just thrown in, I despise folding laundry. Great Idea – I don’t know why I never thought of it myself! I just cleaned out and organized my underwear drawer last week. It was a mess before, and it’s so nice to be orderly and organized now!